Imagine the freedom to paint just about anywhere! Cobra Water Mixable Oils are artist-quality oil paints that offer the freedom to paint indoors or outdoors, in studios, at academies, or in your living room. Painting with Cobra is the same as painting with traditional oil paints — however, you can mix the paints with water and no solvents are required. Cobra paints can be applied using traditional oil painting techniques with no visible changes during the drying process — colors, brushstrokes, and applied textures remain unchanged after the paint has dried. They work well with brushes, painting knives, rollers, sponges, and more. 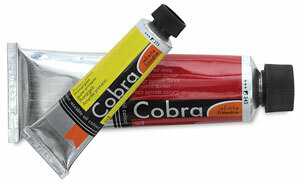 Cobra's versatility of application allows them to be used for creating opaque and transparent layers, watercolor wash techniques, alla prima, and glazing techniques. The colors offer a uniform degree of sheen and uniform drying time across the range. The range consists of 70 transparent, semi-transparent, semi-opaque, and opaque colors that are highly lightfast, including 35 made from a single pigment. Ten colors are based on highly exclusive pigments, such as Cadmiums, Cobalts, and Chromium Oxides, as well as an exceptionally transparent Oxide Red and Oxide Yellow. Because Cobra oil colors offer the highest degree of lightfastness, the original colors will remain unchanged for at least 100 years under museum conditions. During the grinding process, the high-quality Cobra pigments and oil are pulverized in a triple-roll mill until artist-quality fineness has been achieved. Because Cobra Oils mix with water and don't require the use of toxic solvents, using them protects your health and the environment. Equipment and hands clean up easily with soap and water. Cobra Water Mixable Oils offer exceptional pigmentation, a low evaporation rate, true water solubility, excellent brush stroke retention, and a sustainable paint layer.